When I get asked which universe I prefer, DC or Marvel, I go with DC most of the time. Although Superman vs Batman got so much hate I still loved it dearly but in this case, Marvel has yet again come out on top. DC does a lot better with their TV shows but Marvel is still king of the big screen. Captain America: Civil War was for me probably the best Marvel movie so far. The Russo Brothers were behind this great story and nailed what a comic book movie should be: part story and action. Those two things were both equally balanced and that's what made it great. 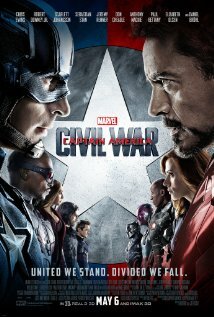 Civil War revolves around Captain America and the Avengers deciding whether they should be supervised by the government or continue to operate as a private party. In some aspects it is a good way to see them being watched because of the destruction they cause while saving the earth countless times. But also with United Nations in charge, who knows how their hands could be tied, preventing them from helping in times of need? That's when Cap disagrees to sign his soul away. Iron man decides to sign but for really good reasons and that's when the civil war begins. Besides the great story this movie brings we get to see every single Avenger and up and coming Avengers join the fight against each other. Captain America's (Chris Evans) team consists of The Winter Soldier (Sebastian Stan), Hawkeye (Jeremy Renner), Scarlett Witch (Elizabeth Olsen), Falcon (Anthony Mackie), and Ant Man (Paul Rudd). Iron Man's (Robert Downey Jr.) side includes Black Widow (Scarlett Johansson), War Machine (Don Cheadle), Vision (Paul Bettany), Black Panther (Chadwick Boseman) and your friendly neighborhood Spiderman (Tom Holland) himself. Understandably, some of our heroes have troubles picking a side and are conflicted. In the end each person makes their decision but with a cost. As for the new guys, Black Panther was portrayed marvelously and if any of you know his back story, they did great. Spiderman, well, there is a whole lot more of him than what you see in the trailers and trust me, although he's just a kid he can hold his own. Ant Man, although not new, is full of big surprises when he enters the fight as well. I know I will watch this movie again and if you weren't planning on seeing this flick, I urge you that it's worth it. There is a mid credits scene and after credits scene, of course, so don't just get up and leave.